CASHUN SEASON 15 SPECIAL ANNOUCEMENT! A brief collection of one of our favorite video challenges! We have had a wild ride for the past 24 months with expansion cities and being approached by two Hollywood producers to bring Cashunt to Television which has been a fantastic experience and surreal. As we approach our new season in 4 months we will be announcing two new cities for our 15th season. At that point we will be taking an intelligent break from new expansion and concentrate with the great cities that we currently have in our library. I believe it is a smart move rather than an overload. Sometimes businesses look for the golden ring quickly and let's call for what it is..%85 failure. As the old story of Tourtoise and the Hare goes....slow and steady wins the race, making the hare wonder how the Tourtoise always wins every race he challenged him to. So we have always taken that approach since Cashunt's inception and we will continue with that formula as we move forward. Not to say we won't listen to considerations, we will know when the right move is when the time is right. Always seek out a mentor..and learn. When I was started out with this crazy idea that we call "Cashunt", I really tried to seek out as much research as I could about "games". I was really influenced and inspired by cultural aspects of art..film, music, comics, classic games, noir, and theater and put them all together into one product. But sometimes that wasn't enough..so I seeked out a little guidance to make sure I was pointed to the right direction. So I seeked out people that inspired me in the past, that I would call unbiased and that I call my friends / mentors today. People like Patricia Manning my old marketing/advertising professor, Philip Sabratta my theater professor, and Angela Peri. Each one different from the other but each one being upfront and honest about the creative direction I was taking. These lessons they gave me hold true today and will continue to do so..
With that said if you are looking to make a "change" in your direction, all the power to you! The one thing I would say to you is "don't assume you know it all" because in the end you don't. Seek out a mentor..who he or she may be is different for each and everyone of you. They could be a family member, good friend, professor, etc. Just seek out that person or persons that are "neutral" in their opinion and someone you can trust. Be ready for creative criticism, BUT do not get discouraged when you hear it and consider it as a tool to further enhance your product. In the end what ever project you decide to take on..you will realize you will never tire from it or ever look at your watch...because you love it! But just as musician always practices and feeds their craft, so should you and watch your dream slowly grow into a reality. So here we are already for the Fall, funny how the years go by so fast. But Fall is always a fun and exciting time for us here at Cashunt! First of which is this years version of The Haunted Dash taking place in Salem Ma this October for it's 13th season! This year we have added a little bit more to the game to make it even more challenging..but yes the "rats" are still in the game ;). The other thing that we are offering with The Haunted Dash only for the month of October is that if the whole group of players come to their game in costume we will give each and every player a discount of their ticket price! Hey your in Salem in the month of October, so let's all get in the spirit! The other thing we are changing is that we are taking out The Turkey Dash for the month of November and making all the city Dashes with a Fall theme instead. With that said if you are planning for a game on "Black Friday" this year we would suggest planning well ahead, Black Friday is one of most popular days! Lastly we will be in our Fall / Winter Hours starting November 1 where games will take place 7 days a week as usual but start at the top of each hour from 10am to 3pm. Summer Video Update with new Game Design and The Upcoming Salem Mad Dash! Hope you are all enjoying your summer! Just want to make a quick update concerning Cashunt going to the great city of Toronto! As of now looking to host Cashunt games in Toronto in 2015 instead of Fall of 2014. The reason is simply because we want to continue to establish our presence in Charleston, Philadelphia, Chicago, and NYC before we tackle a new location. With that being said we see as 2015 as the perfect time to introduce Cashunt in the city of Toronto for our Season 15 line up. Stay tuned! New Video Blog About The New Cashunt Cities and more! Let's Talk About The New Cashunt Cities! To Be On Reality TV or Not To Be...That Was The Question.. The last 12 months have been amazing for the Cashunt product and interesting at the same time. The product has grown and we have also added 5 other Cashunt cities to our family which has been working very well. The other thing that happened that some of you might know from previous blogs of the possibilities of the Cashunt being transformed into a television product. With that said, in the past year we were approached by two major Hollywood production companies that wanted to take the Cashunt product and make it into a 6 episode reality format competition series. At first it sounded pretty exciting of Cashunt ending up on one of the (Big 4) networks but there were catches of course. For those of you that know anything about how the Hollywood machine works it's pretty simple "what your product is and how that translates to screen" is not a true representation of the product. So decisions had to be made and once the essential excitement of being on television wore off, it was about being "real" about our business. The format game didn't work..too expensive, not a true depiction about the product, etc. To be honest I was relieved...but they threw me another option...how about a docu-series, that would have the "drama and the goings on, of a behind the scenes look at Cashunt and the other Cashunt cities"
If there was anything out of the two ideas I was looking for Cashunt to be, it was a competitive TV game show series. I was definitely not interested in a docu-series format, to their surprise. A docu-series for the most part is a cheaper way of product to be placed on television..and for the most part it would be"scripted and un scripted". What I explained to the producers is that I didn't like the idea of something I worked so hard for to be exploited. The exploitation of the business, myself, my team/family, partners, and most importantly my customers...was not in the cards If you watch most of the docu-series reality shows out there..you have owners criticizing their team, criticizing their patrons / clients and fabricating arguments just to make "Good TV" Quite frankly, that's just not us..
We are very close to partnering up with Tourguys in Toronto, Canada to start offering games it their fantastic city! This will be a totally different flavor of game and really concentrate just like our other locations of their beautiful and hip location. With the inclusion on New York City this season Tornoto is a great second location for this season. There might be a third location this year..but we can't talk about it right now because it's an avenue that is not officially decided. Right now the other cities that we are concentrating in bringing Cashunt for 2015 is Savannah, Ga and San Diego, Ca. After this really harsh New England Weather I'm thinking of warmer locations. Cashunt Toronto will hopefully start in late spring/early summer. It's a good day at Cashunt! So we are in a transition that we are finishing up by moving to a new office and adding cool team members to our cashunt family. The other cool thing that is happening this weekend is our debut in NYC! This is one of those things I have been waiting for, for a looooooooong time...but we are here and I am stoked! We have great partners in NYC which are The Levy's of Levy's Unique New York..and I am sure will be bringing in a whole new dimension to the game in the big apple. The New York location will be divided and broken into separate games that members of the public can choose. The game that is debuting tomorrow (Cashunt's NYC Mad Dash) will take place in Little Italy, Chinatown, and the financial district. This version of the game will have a different start and end location because the way Manhattan is shaped (narrow) so the game will start in Little Italy and end at Bowling Green. The other games that will be available for New York soon will be the Mid Town area and Brooklyn. So first thing is first and we will cross that Bridge when we get there ;) As of now New York will be offering Cashunt's NYC Mad Dash, Bridal Dash, and Birthday Dash. Cashunt New York...but where in NYC? So we just made the announcement of having branched out to NYC, which we are stoked....but now comes the work.. But is it really work when you enjoy what your doing? We are going to start with one location in NYC, and slowly build from there. With that said, right now ny games will take place in Downtown. I was taken on a tour last week to observe the playing area and all I could see was so many options to making this version of Cashunt a really fun experience! When we mentioned NY to some people prior to our announcement...people were asking if it will take place in Time Square? The answer is no..for now. What we want to achieve with this version is to show our players a different view of New York City that is rarely advertised. That way you do indeed see the city in a different light and now collaborating with Levy's New York..the possibilities are endless. But the next city in the spectrum of NYC is....Brooklyn... I think that would be a very interesting location to this really hip city.. More to come!! Enjoy New York Cashunters! As most of you know we love promotions and always try to get the public into our little zany world.. With that said, there has been a cool promotion going on for the past few weeks right under your noses. 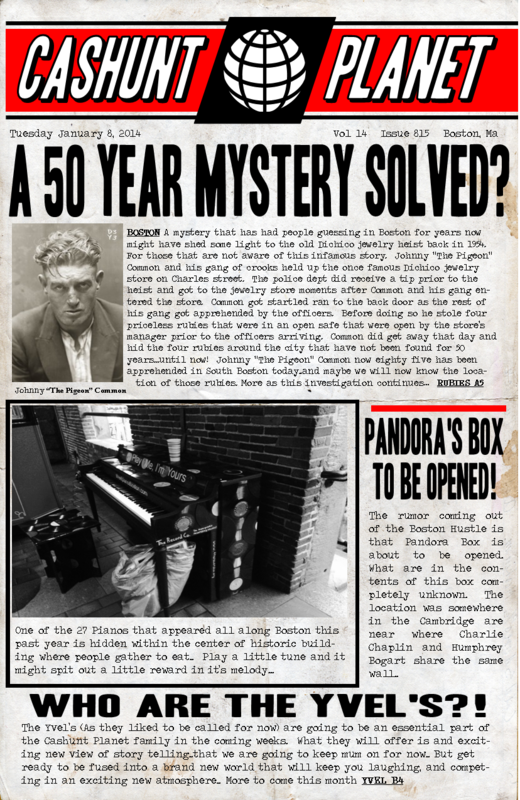 It's what we call the "pigeon case" about an "old heist" and some lost diamonds that have been missing until now. These "diamonds" are scattered around the city and now the clues are out there to guide you to them! Now you might be asking yourself why should I care? Well...that's a great question and now let us enlighten you.. Read the postings to the pigeon case on our facebook feed and twitter feed and it will give you clues to where these diamonds are. Once you figure out that location go there and search for the hidden diamond with a secret number to claim your prize. What are the prizes? Bruins and Celtics tickets, Cashunt gear, and a free Season 14 private game for 8 players .Keep in mind that the other diamonds that are out there are duds and will indicate that on the diamond.. If you crack the whole case...well then lets just say you won the grand prize.. Good luck.. The promotion starts this Monday and ends Wednesday at 5pm. NEW SEASON 14 LIMITED CASHUNT GEAR IS HERE!! Experience the Game..Wear The Gear! 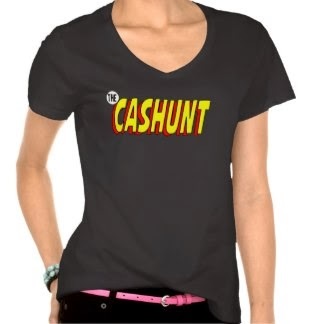 New Limited Season 14 Cashunt Gear is in 15% off weekend promo type WEEKNDSAVERS! Cashunt and Levy's Unique New York (That the Travel Channel named New York's wackiest tour guides) are now in partnership! We are proud and very excited to announce our newest city CASHUNT: NYC! This version has been in the works for months and has finally found the perfect fit with the Levy's! CASHUNT: NYC is going to bring a very exciting mixture of the Cashunt experience and the culture of NYC into a fun, exciting, competitive, and memorable game! Games will start running in March and will be a perfect fit for all private events from social to corporate games. The other exciting part of this partnership is there will be additional Cashunt games that are customized into popular New York spots such as Brooklyn, Midtown, Downtown in 2014 and 2015. For more information on CASHUNT: NYC call our office at 866-276-4733! We hope you all enjoyed this past holiday season with your family and friends! It's amazing how the years fly by and here we are in 2014 already! We are taking a 2 week hiatus and then we are back to work as we officially enter the 14th season of CASHUNT! It feels like yesterday where we produced our first game and here we are over a thousand games later..wow! The first part of the agenda is to announce our new Cashunt City later this month..something we are very excited about and close to finalize. This new city will definitely bring a multi-flavored experience to the Cashunt product..and the possibilities are endless. We were thinking of a second Cashunt City later in the year...but we might just want to go one city at a time every year. Also this season as we will be introducing a new game book design (if you played Holiday Hijinks this past December you had a beta sneak peek ;) ) It's no secret that we change the design of the book every year, it just keeps everything fresh.. I don't believe in a product being stale...because if you get comfortable in your product and don't switch it up......it looses it's luster. So this season's game materials are inspired by Marvel's Silver Age Comics line (1960-1974) I think the booklet's look brings the fun of a Cashunt game experience out of each page. Also the other cool thing we are doing is we are color coating medals.. Each game we offer have a different theme and color scheme to the game materials ( Bridal Dash, Harvard Hustle, Sweet 16 Race, etc) .....so... why not the medals?? The medals became such a hit last year that the premium look of the medal made the players really wanted to win one. ( which was very cool) So last November one of "Vet Cashunters" that has played the game several times, suggested why not color coat the medals to the colors of the game? So with that said Jennifer we listened and I think it was a great idea to have every winning medal have it's own identity. Thanks again! This year's 14th Championship will not be played in Salem, Ma in October as we have done in the past 2 seasons. ( Great Location in October Though!) It will be played in Harvard Sq with the Harvard Hustle game in September. A date will be announced later in the coming months, but just like always it will be held on a Sunday at noon! So there you have it for now..there are a several other things I want to tell you all but I need to keep my lips tight..just because they are not ready as of yet..but everything will be by 2/1. So sit tight as we have some fun in store for you in the next 11 months.. All the best to all of you!